A naturally fragmented moldavite is an infrequent form. It is a special sort of moldavite, so called fragment shape (all its parts were recovered). February 19, 2017 in Rare. A rare phenomena of visible closed bubble in a raw moldavite. January 24, 2017 in Rare. 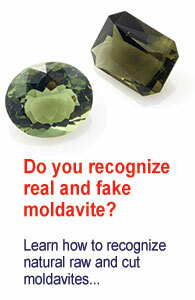 A moldavite damaged during extraction usually has chipped off part or is more or less broken. January 10, 2017 in Rare.